Cutters Skips provides the very best skip bins Brisbane Northside service, offering a versatile range of skips that are available to you 7 days a week, inclusive of delivery fees. If you’ve been online searching for, ‘Skip Bins Brisbane Northside‘, ‘Skip Hire Brisbane Northside‘, or ‘Skip Bin Hire Brisbane Northside‘, look no further than Cutters Skips! Being a locally based business that has been in the Brisbane skip hire industry for 15 years, rest assured Cutters Skips will know exactly where your skip hire location will be. Cutters Skips is a family operated business, taking pride in offering excellent customer service to both residential and commercial clients. All suburbs within the Brisbane Northside region can be serviced by Cutters Skips, with free delivery offered in conjunction with every skip hire. Northern Brisbane suburbs include: Albion, Banyo, Chermside, Eagle Farm, Everton Park, Newmarket, Nundah, Redcliffe and Sandgate. The delivery of skip bins to Brisbane’s Northside suburbs can be booked in for any type of job, no matter how big or small. Skip hire Brisbane Northside is suitable for residential homes, commercial properties, offices, industrial complexes, building sites and public areas. You might think your clean-up is on the tiny side, but if your waste overflows multiple wheelie bins, it is time to book in your Brisbane Northside skip bin hire with Cutters Skips. Even large-scale commercial property waste can be taken away stress-free from Cutters Skips. Your skip bins can be kept for 7 days, leaving you plenty of time to get your jobs done right! 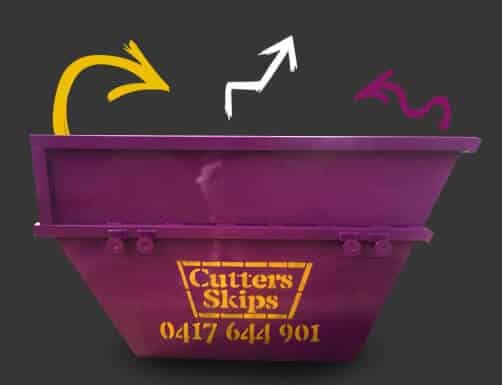 When you’re looking for skip bins on Brisbane Northside, you’re looking for Cutters Skips! Call us on 0417 644 901 today. Cutters Skips will arrive at your Brisbane home or business promptly, ready for you to discard of your unwanted materials with ease, giving you more time to get the job done. When you're looking for skip bin hire Brisbane Northside, Cutters Skips has you covered. If you are due to renovate your home, the chances are you will need to book in for a skip bin. DIY projects around the home will no doubt result in a whole heap of unwanted by-waste. Whether your DIY tasks involve refurbishing a lounge room, a bathroom renovation or a roof replacement, hired skip bins provide you with an efficient way to get rid of your hard rubbish. Our Brisbane Northside skip bin hire service can take away roof tiles, pipes, glass, insulation, rubble, cement and most things in-between. You don’t want the inconvenience or untidy look of excess materials dumped in the front yard. Instead, allow Cutters Skips to responsibly remove your renovation waste for you. Be aware that asbestos, chemicals, paint, batteries and food waste are not allowed into a hired skip for legal reasons. Contact your local council for information on how to dispose of these materials in the correct way. Sometimes, skips are required for smaller jobs around the house, even if there isn't as much waste as a full renovation. Household junk that may require skips includes broken furniture, old knick-knacks, smashed crockery or vases, torn and damaged books or broken toys.There are times when de-cluttering the home may overflow your garbage bins. When this is the case, consider hiring a 2 metre Brisbane mini skip. For skip hire Brisbane Northside call Cutters Skips. With pricing starting from $160 inclusive of GST and delivery, we're hard to pass up. Skip bin hire on Brisbane Northside is in growing demand. Construction and renovation work is in full swing and we're here to help. Construction waste is usually made up of removed and unwanted building materials such as bricks, concrete, glass, wood, insulation, nails, rubble, dirt or electrical wiring. If you require a skip for commercial reasons, Cutters Skips can provide you with skips up to 6 metres, which will hold the equivalent of 24 wheelie bins worth of waste. Yard landscaping can result in a surprising amount of waste. The upheaval of dirt, tree stumps, leaves, weeds and dead plants from your yard can lead to a large quantity of green waste; probably much more than your green wheelie bin can accommodate. Green waste aside, you’ve got broken fencing, paving, steps or retaining walls that might need removing from your yard, which will soon clutter your nature strip if you don’t book a skip bin for Brisbane Northside. Whether you require a mini skip Brisbane 2m skip or a much bigger capacity, skip bins to Brisbane Northside can be booked in for your next landscape project in advance or at short notice with Cutters Skips. It is true to say one person’s trash is another person’s treasure, which is why Cutters Skips remains 100% dedicated to being environmentally responsible with all waste collected from your skip hire in Brisbane Northside. Cutters Skips are consciously aware of the environmental implications of throwing unnecessary waste into landfill. Therefore, you'll be pleased to know that not all of your trash will be destined for the ground. Much of the material you no longer need can be recycled and reused; metals, paper, plastics and glass can all be reused for a variety of products. Once your skip has been collected by the friendly Cutters Skips team, materials will be taken to the sorting facility and separated in accordance with recyclable materials regulations. When you think about the costs associated with hiring a skip bin, you often assume it is going to be expensive. But when you choose Cutters Skips, you’re choosing a convenient and cost effective solution for general tidy ups, building scraps and everyday waste removal. They offer the most reasonably priced skip bin hire for Brisbane Northside and surrounding areas, providing the skip bins for up to 7 days, with free delivery. This leaves you nothing to worry about besides getting your job completed. There is a skip bin option to suit every need, budget and job size. For everyday clean out jobs the most popular option is the 2 metre mini skip Brisbane special. With sizes varying up to the commercial job site size of a massive 6 metre skip bin, you will have plenty of options to choose from. Skip bin hire in Brisbane Northside suburbs can be arranged in advance or at short notice with Cutters Skips. If you’ve started a garden clean-up and underestimated the hoard you will accumulate by the end of your job, call Cutters Skips who will arrange for a last minute skip hire booking to your north Brisbane property. Perhaps you’ve been assigned with a house-estate clear-out, but had no idea of the extent of the job? It’s time to call in the Brisbane skip hire professionals! Consider Cutters Skips as your go to skip hire crew for weekend bookings. Instead of shifting your unwanted trash to the dump yard yourselves, you can wave goodbye to your waste without leaving your home. Weekend skip hire is no problem for Cutters Skips and nor should it be an issue for you. From Albion to Banyo, Newmarket to Zillmere, your skip bin will be delivered to Brisbane’s northern suburbs on-time and hassle free. If you are concerned with narrow spaces on your property or commercial business site, speak to a friendly Cutters Skips consultant, who will establish the right truck to deliver your hired skip. Great service, I ordered this morning and got it delivered within 2 hours! Will recommend, went over the 7 days hire and did not get charged for it! Easy to book, friendly on delivery and at the time I wanted it!